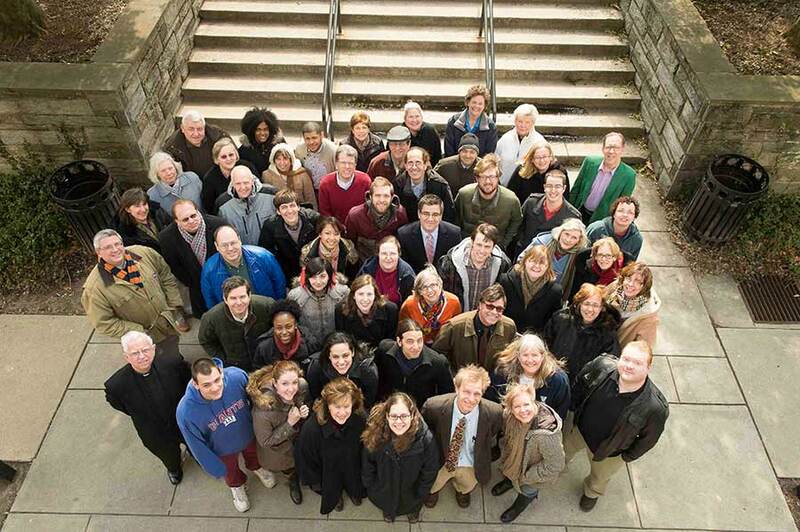 The staff at Falvey Memorial Library sends best wishes to our departing director, Joe Lucia, as he assumes the position of Temple University’s dean of university libraries. 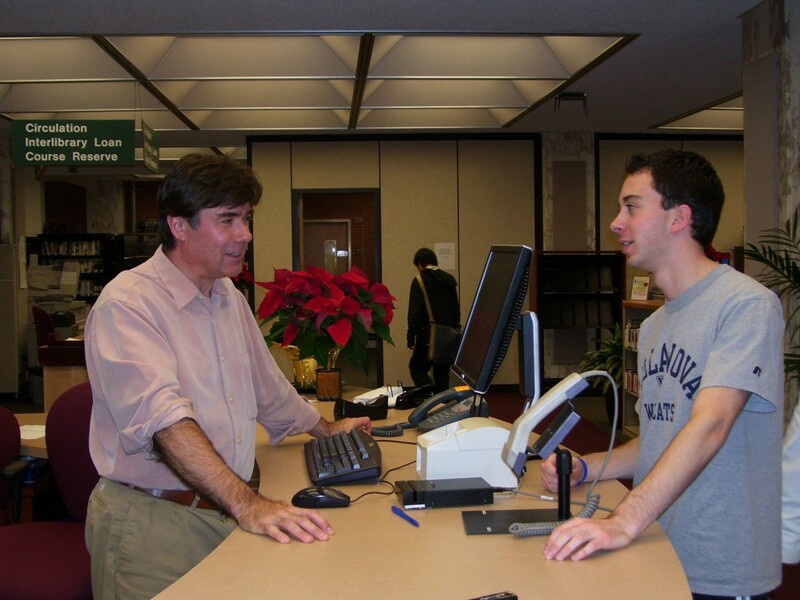 Joe has served at Villanova since the summer of 2002, and leaves with an outstanding record of innovation and accomplishments that has earned Falvey Memorial Library national recognition, and has made the library more popular than ever with our student body. We’ve gathered a scrapbook of photographs and memories to commemorate his legacy and to publicly send our gratitude for a job well done! 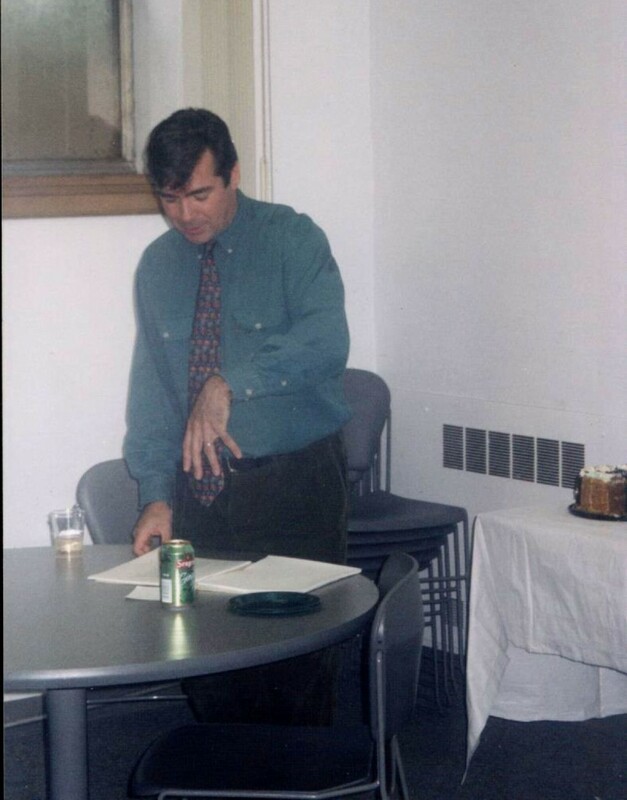 Joe began his tenure at Falvey Library in July 2002, and in the fall of that year he held a poetry reading for the staff. 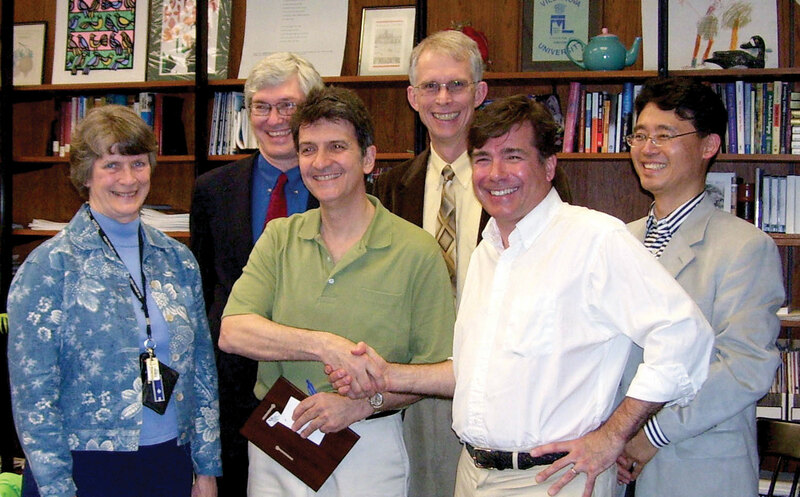 Always ready to celebrate staff accomplishments, Joe congratulates Domenick Liberato for receiving the Facultas Award in 2008. Thank you, Joe, for creating an environment where staff can freely engage in innovative projects and have fun in the process. Joe Lucia and Louis N. Ferrero sign legal documents forming a limited partnership between Falvey Memorial Library and the American Catholic Historical Society. 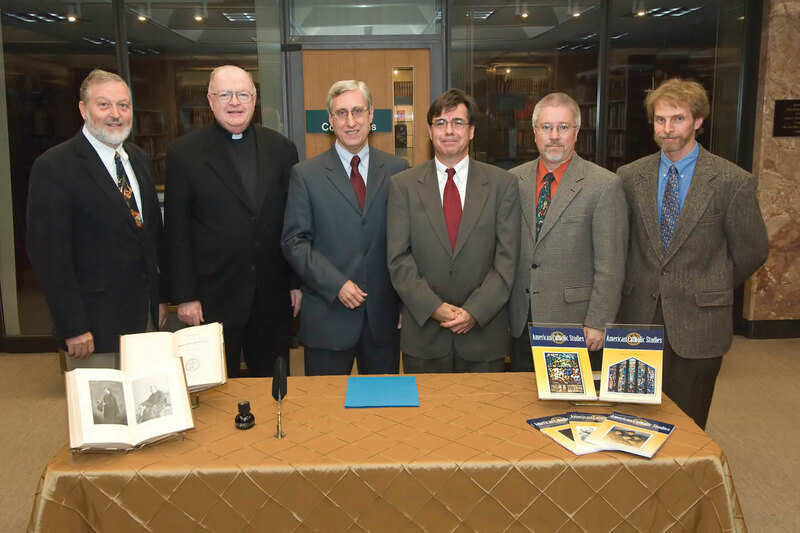 Pictured (l. to r.) Rodger Van Allen, Ph.D., Monsignor James P. McCoy, Louis N. Ferrero, PE, Joe Lucia, MA, MS, Craig Wheeland, Ph.D. and Michael Foight, Special and Digital Collections. 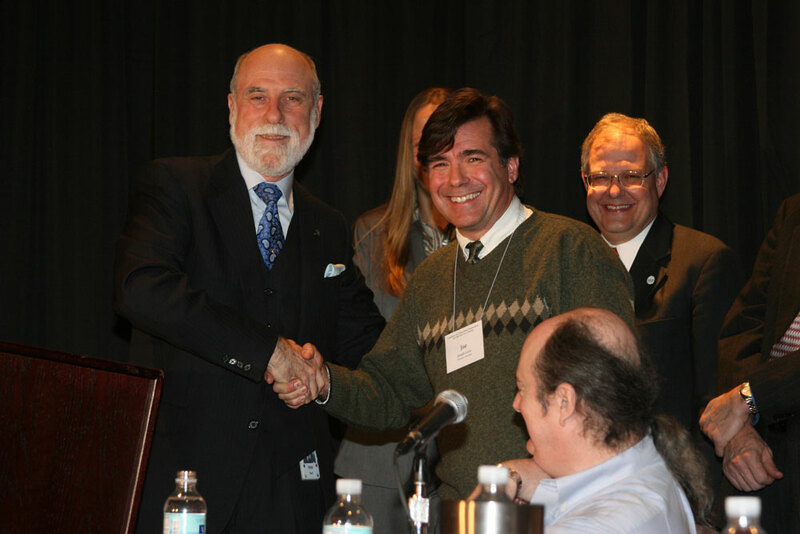 Joe Lucia and Vint Cerf shake hands in honor of Villanova University receiving a 50,000 Mellon Award for Technology Collaboration (MATC) for its VuFind Project. Winter, 2009. Early in his tenure as library director, Joe provided support as I took Family Medical Leave over the course of a year to help my daughter take care of our gravely ill granddaughter. My library colleagues pitched in too to cover my responsibilities. Our family has always appreciated this. Joe, working his shift on the Information desk in 2009. 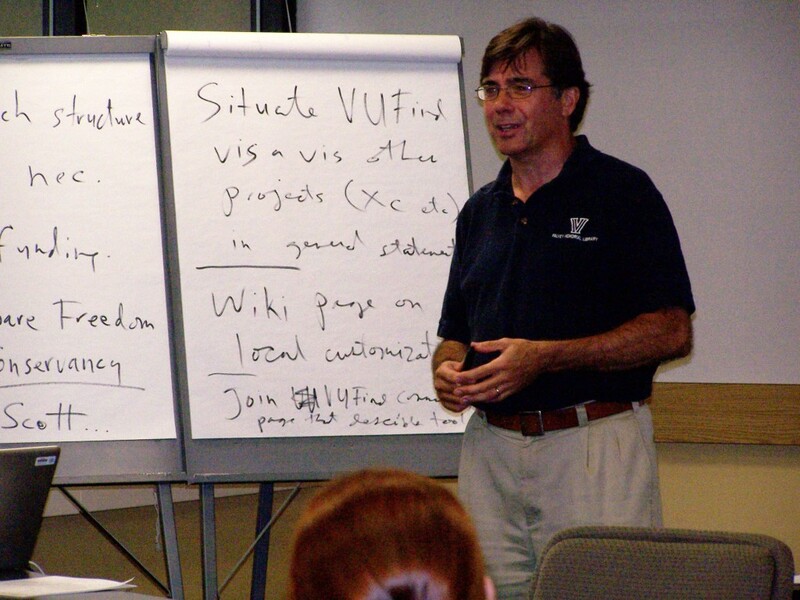 Joe at the VuFind Summit in 2010. Joe with librarian Barbara Quintiliano and Open House prize winners in 2010. Joe getting ready to rock the Christmas Party 2011 with the Mildcats (early version of Marc Fields and Bad Data). Congratulations on your new gig! Although I’m sad we only got to work together for a short time, I know great things are on the horizon, and I eagerly look forward to future collaborations (and Marc Fields shows!). 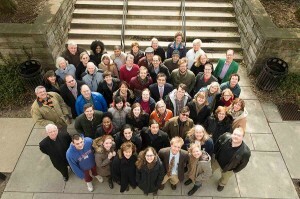 I consider myself tremendously privileged to be part of the creative, cooperative, and intellectually engaged library you’ve built here. Thank you for Falvey, and best wishes for Temple! If I had a nickel for each time I said “there’s never a dull moment around here,” I could foot the bill for the next staff picnic myself. 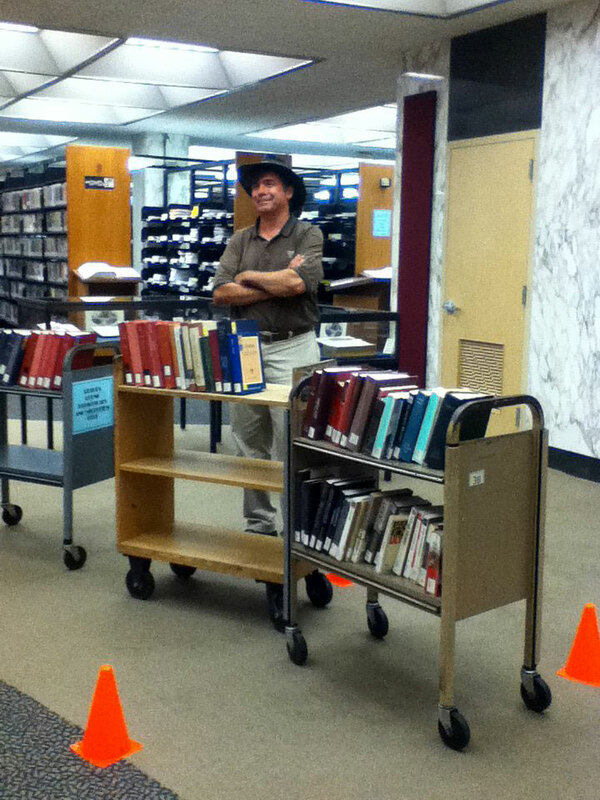 Thanks, Joe, for creating a world of possibilities and a place of yes here at the library. 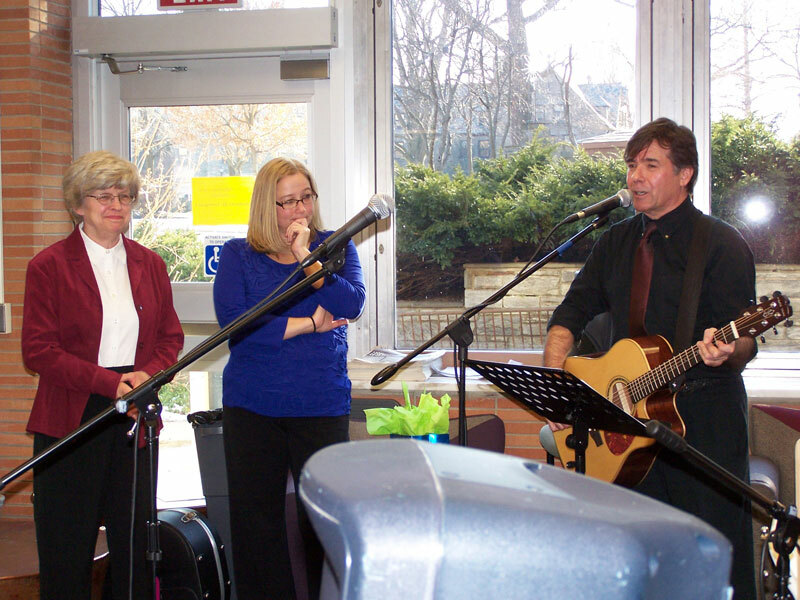 Always ready with a song, Joe serenades staff member Mary Heyman on her last day of work in January 2013. 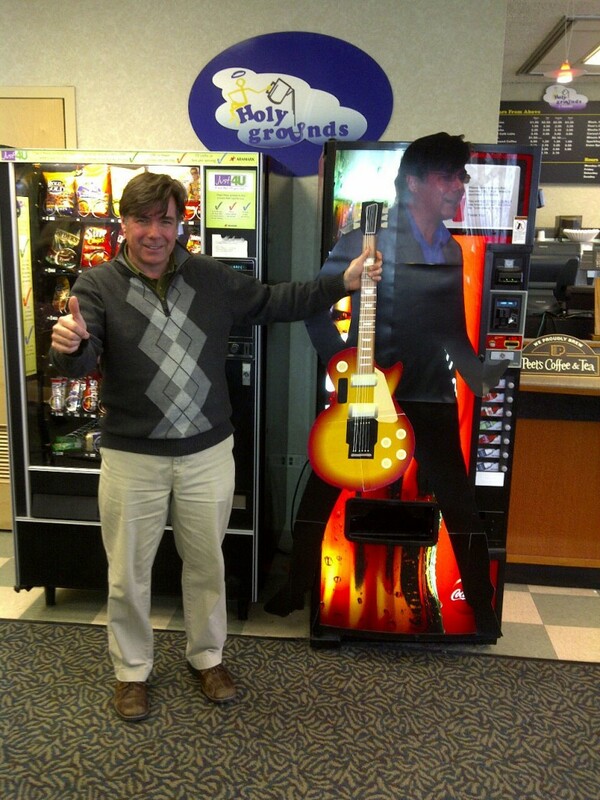 I remember getting back from lunch with Joe after my job interview at Falvey was over and thought, “wow, I hope things are going as well as I think they are- the director and I mostly discussed guitars and amps! 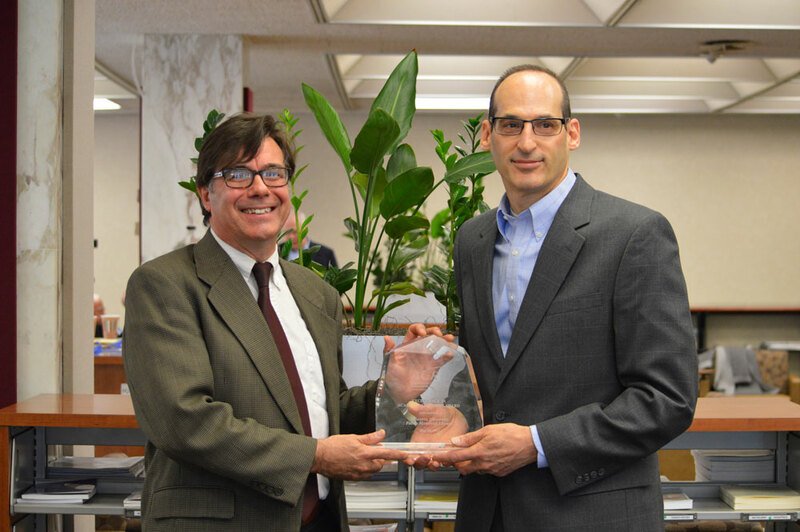 Joe Lucia and Steve Bell show off the 2013 ACRL Award for Excellence. Darren Poley begins as interim director beginning July 1.